Publisher: Gall & Inglis, date unknown. No later than 1890. 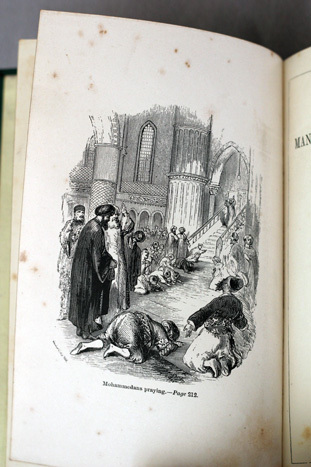 Most likely first and last edition of the book ever published. Rare. 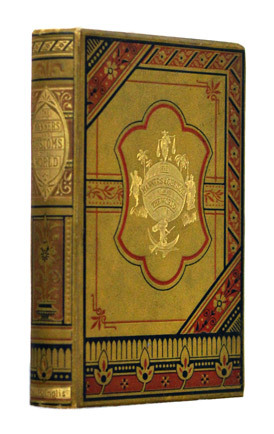 Condition: Hardcover, decorative amber cloth with extensive gilt. In very good condition for its age. Name inscription on fly page dated 1890. An odd little curiosity. THE DESIGN of this volume is to furnish brief accounts of the distinctive customs, manners, and ceremonies prevalent in different nations of the world. It is always a source both of information and entertainment to notice how countries vary in these respects; and while, in the following pages, an attemt has been made to classify national characteristics and observances, one main object of the Editor has been to illustrate these by selected descriptions from the works of travellers who have witnessed them. It is hoped that, to young readers especially, the work, which has been carefully compiled, will prove both interesting and instructive. The editor has attempted to classify national characteristics and observances by selecting works of travellers who have witnessed them. He includes a great variety of customs such as funerals, holidays, women’s life, bathing, religious observances, court ceremonies and feasts. 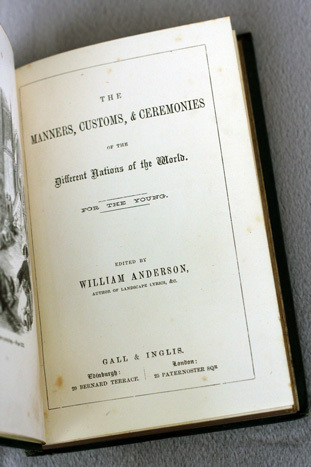 A book compiled from various “works of travellers” to “furnish brief accounts of the distinctive customs, manners and ceremonies prevalent in different parts of the world” as a “source both of information and entertainment to notice how countries vary in these respects”. A German nobleman’s household in the Seventeenth Century. Love and marriage among the Jews, funerals in Rio Janeiro, French gallantry, secret signs of the Arabs, Christmas customs in Norway, toys and games of different nations, odd customs among the Armenians, Egyptian female manners, Rank and titles in Sweden, etiquette in China, North American Indians, The Aguadors of Granada, Easter festivities in Russia, a Japanese death, A Quadroon ball, A breakfast in New York, Persian feasting, a Horse Race in the Sandwich Islands, Turkish beggars, female government, kissing the Sultan’s toe, etc.